This article explains what each field is and does under the facilities tab in system setup. Facility Information shows your Business name and 5 character Facility code. You can request a change via our Store; fees may apply. Default Options is used to set what your default sort should be on your Agreement listing, as well as what automated formatting to use in the firstname field (on letters & emails) and what to show as the default view when you open an Agreements Transaction screen. Next Numbers is used to set what the next Agreement, Reservation, Sales Enquiry numbers, Credit Sale and Invoice numbers (respectively) should be. These are auto-incremented by Storman each time a new one is added, so they should generally be left alone. Please contact Storman Support if you need advice on changing these numbers. 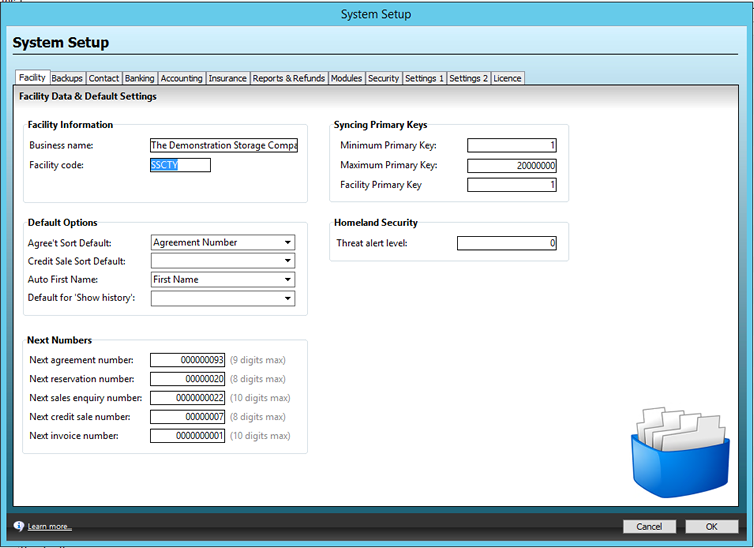 Syncing Primary Keys is used by Storman Support and is generally only used by Storman Central facilities. Homeland Security is used to set the Threat alert level, in relation to the Threat Level / Terrorist Activity setting.